World’s most famous model, Kate Moss, has been one of the world’s largest iconic muse for over 3 decades. Photographers Mario Testino, Albert Watson, David LaChapelle, Ellen Von Unwerth and artists such as Banksy, Russell Young, and Mr. Brainwash have been some of the most influential individuals to do so. English born, Kate Moss, has achieved something that no other model has. She has successfully reinvented herself for over 25 years, launching trends and defining styles from Kate Moss clothes to Kate Moss hair, while remaining utterly timeless. Moss style has gone from heroin chic in the 90’s to boho chic, and even skinny rocker aesthetic at the turn of the century. This powerful icon has appeared in ad campaigns for designers including Gucci, Dolce & Gabbana, Calvin Klien, Chanel, Rimmel and Louis Vuitton. She even received an award at the 2013 British Fashion Awards to acknowledge her contribution to fashion and was rated in top 100 most influential people by TIME magazine. Practically fabricating the word Kate Moss style and gaining huge publicity as a Kate Moss and Johnny Depp power couple, it’s no wonder photographers can’t get away! Photographer Mario Testino is listed in Time magazine as the top fashion and celebrity photographer. Mario Testino spearheaded the image development of several high profile fashion companies including Dolce & Gabanna, Michael Kors, and Tom Ford. In the series of portraits Testino brings to the Kate Moss Collection, Kate Moss and Kate Moss London, he takes a holistic approach to capturing the woman behind the fashion. Classic of his work, we find the intimacy of a seemingly accidental yet intriguingly elegant capture of the iconic beaut. 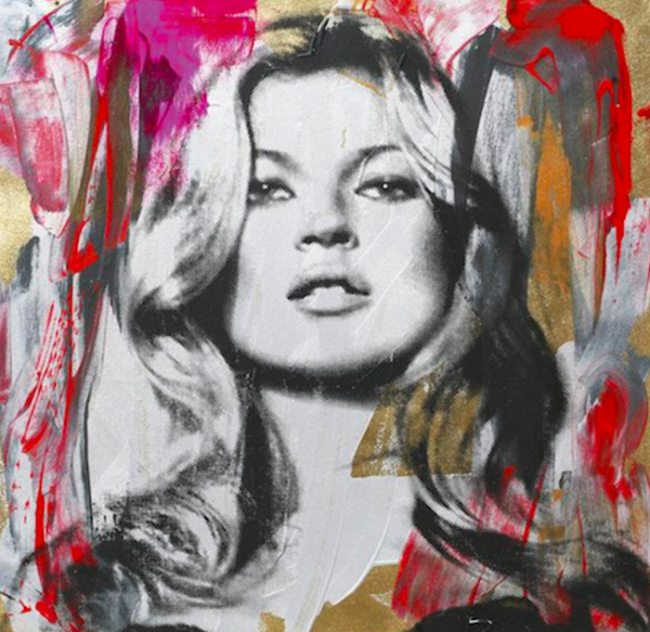 Signed and framed on screen print, Kate Moss by Banksy was created by the artist in 2011 while the world-renowned supermodel was on her honeymoon. The special work was a surprise for the model, which was showcased in her bathroom. 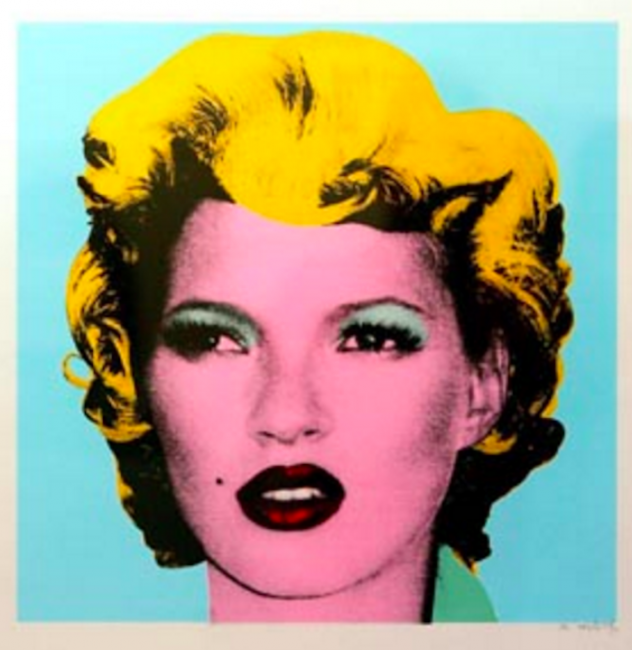 The Kate Moss Collection by Banksy is based on Andy Warhol’s iconic Marilyn Series, appropriates this supermodels’ visage. In a contemporary take on Warhol’s Pop masterpiece, Banksy has superimposed Monroe’s hair onto a gray-scale image of Moss, then stained the portrait with an array of vibrant colors. Albert Watson has made his mark as one of the world’s most successful fashion and commercial photographers during the last four decades, while creating his own art along the way. Over the years, his striking images have appeared on more than 100 covers of Vogue around the world and been featured in countless other publications, from Rolling Stone to Time to Vibe – many of the photographs are iconic portraits of rock stars, rappers, actors and other celebrities. 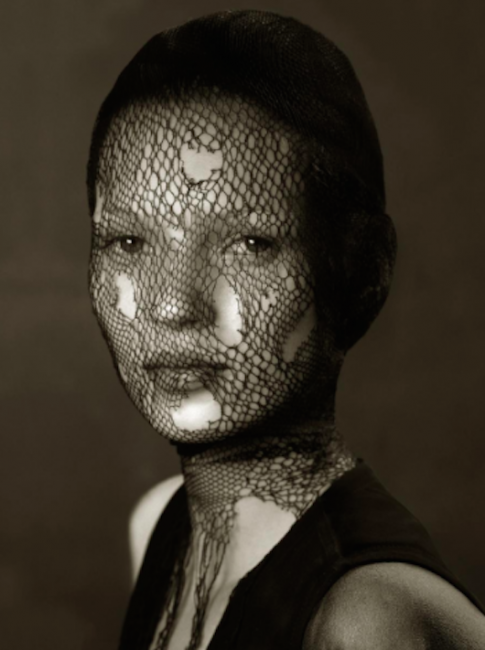 Watson’s Kate Moss in Torn Veil, is an iconic portrait taken in 1993 in Marrakech reflecting an effortless versatility of allure, power and influence. In addition, his other contribution to the collection Kate Moss contact sheet show the many facets of Kate Moss.